Just because you're a lefty doesn't mean you can't shoulder an awesome axe. Your Epiphone Les Paul Standard left-handed electric guitar brings you all class and no nonsense with its maple-topped mahogany body, secure mahogany neck, super-smooth 22-fret rosewood fingerboard, alnico neck and bridge humbuckers, sleek chrome hardware, dual volume and dual tone controls, three-way pickup selector switch, and a dependable Tune-o-Matic stopbar. 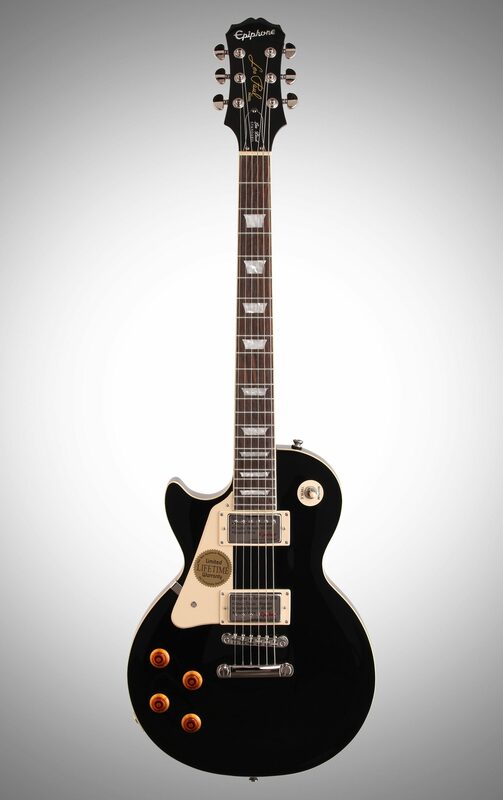 Get all the features you expect from a Les Paul with this left-handed tone-churning machine! There's nothing quite like the dark and full-bodied tone that comes from a Les Paul, and this baby's maple-topped mahogany/alder body will keep your tones rich and full of sonic weight. Mahogany bodies resonate your mid and lower frequencies, offering plenty of sustain, while alder keeps the weight off your shoulder. Maple will add a pleasant brightness to your notes, and as a resilient wood, your Les Paul's maple top will hold up well to dings and scratches. 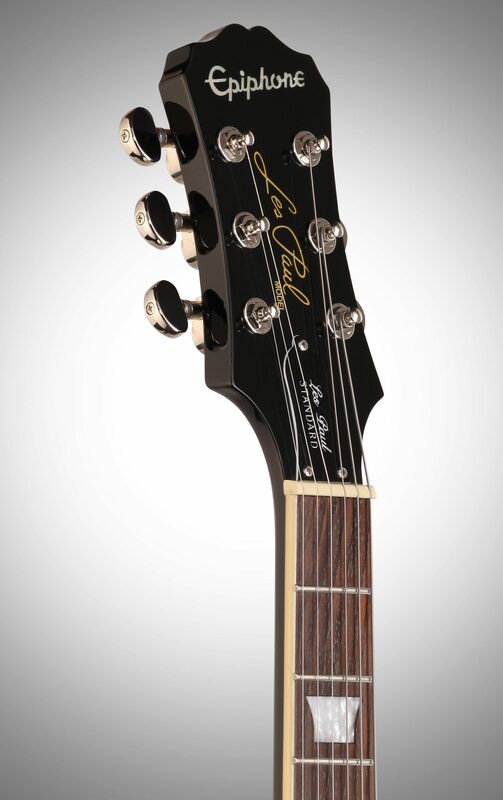 The sturdy mahogany set neck on your lefty Les Paul Standard fits into your right hand like a glove. 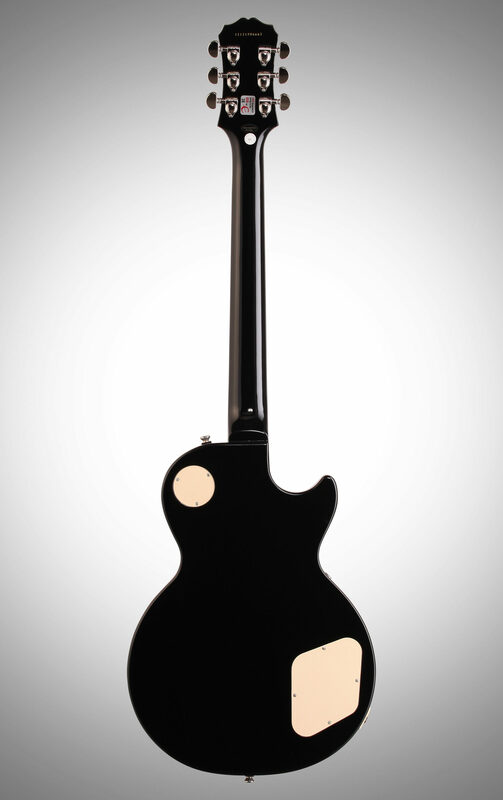 Epiphone crafted this neck to hold your notes in a lingering sustain. This lovely appendage is topped with a smooth rosewood fingerboard, inlaid with those cool Les Paul trapezoids, with 22 medium jumbo frets that harness a comfortable action eagerly awaiting your fingertips. 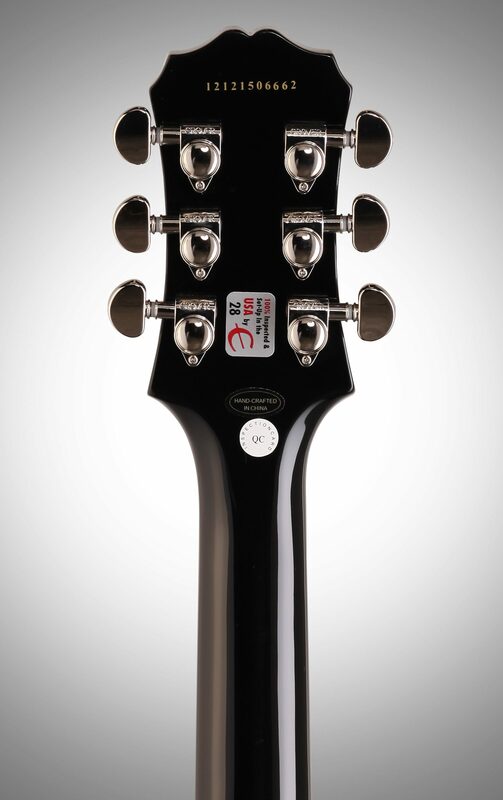 Genuine Grover tuners top off the headstock. 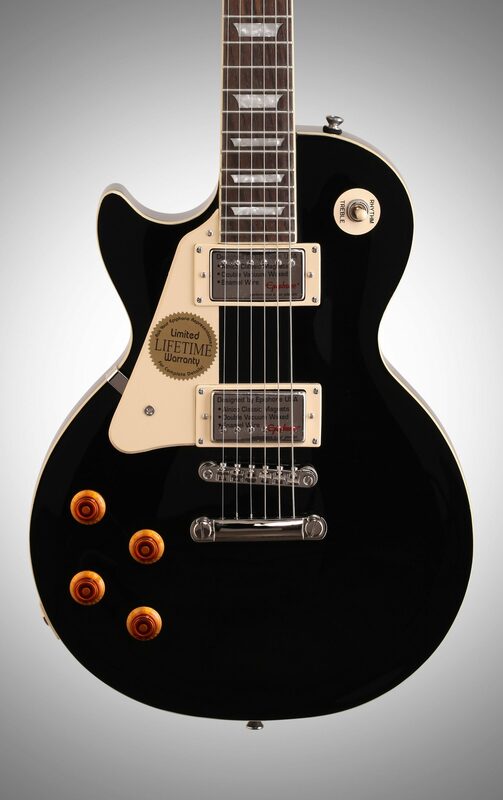 Your Epiphone Les Paul Standard houses a pair of alnico humbuckers to capture and project your playing. Your neck position focuses on the mids and lows of your notes for a thick and dark tone. Your bridge humbucker will brighten things up a bit for an edgier sound that cuts through a little more. Alnico magnets bring a warm and smooth sonic element to your axe for a tone full of body and richness. To give you all of the tools you need to shape your signal, your Les Paul Standard features dual tone and dual volume controls for ultimate pickup independence and seamless tone shaping. A three-way pickup selector switch allows you to set the correct pickup combination for whatever style your sonic signature demands. 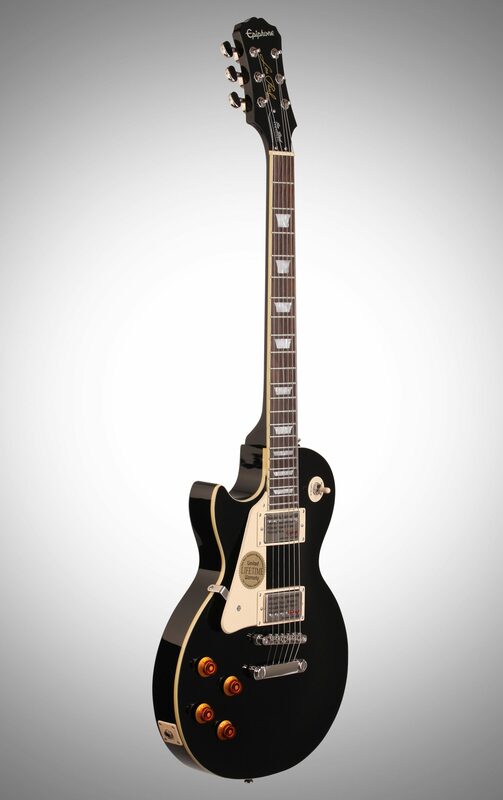 The Epiphone left-handed Les Paul Standard guitar features 2 humbucker pickups and chrome hardware. The scale is 24.75-in. and the nut width is 1.68-in. It has a set neck joint and mahogany neck material. The Pau Ferro fingerboard has a trapezoid inlay. The body material is made of mahogany/alder and has an ebony finish. "If your looking for satisfaction quality, and a great value you have found it here." 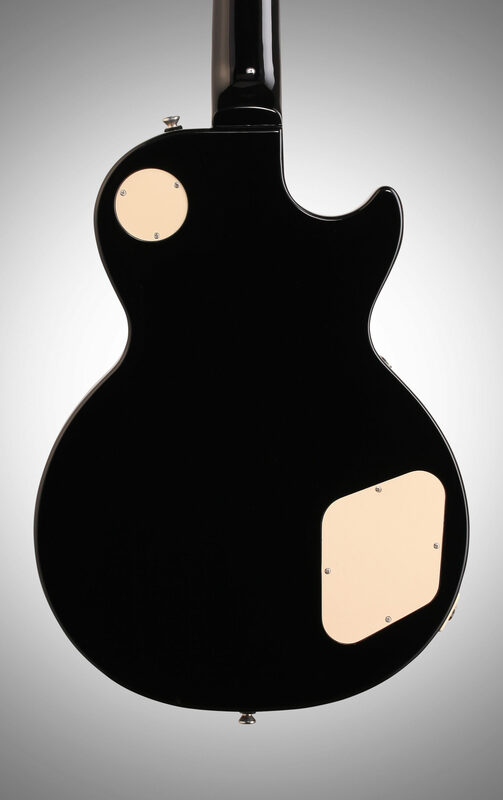 Sound: I received my eipiphone les paul standard last week. When I opened it up It was just what I had been wanting. Great finish as well a great sounding unit. Thanks ZZounds for a low price, fast delivery. Feature: No I am just getting started and I am very happy with the details on this guitar. Ease of Use: To soon to tell for me right now. Quality: Very nice quality great paint, it really has it all. Value: This was the best price I could find. Manufacturer Support: I am a new customer and very satisfied with service,quality, and price this seems like a place I will deal with in the future. The Wow Factor: 10 Overall: Im already shopping for similar interests. Style of Music: Rock,country, etc. Sound: Awesome sound. I am a big Neil Young fan and this guitar matches his tone to a "T". Can't get over how awesome it sounds. Feature: Can't complain. Pickups were great and great sustain. Ease of Use: Only reason I gave it this rating is because the first two weeks or so after it arrived I had to worst trouble with it coming out of tune. Especially the G string. This was after I put a new set of Ernie Ball .10s. Quality: Awesome, can't complain. Value: definitely worth the price. My friend payed about the same price for his. Manufacturer Support: When i called the company to complain about the tuning issue they were very helpful and sent me directly to an Epiphone warranty repair specialist in my area. The Wow Factor: Love the finish.